Can really inexpensive Aldi Alcafé Espresso Whole Coffee Beans be any good? Aldi Alcafé Espresso Whole Coffee Beans, just £1.69 for a 200g bag, but is it any good? Coffee is another of my mild obsessions! 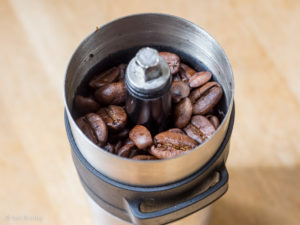 Witness my earlier post about how you can improve the results of your espresso coffee machine with a simple and inexpensive modification. Coffee, even instant coffee, can be an expensive habit, especially compared with tea. Even in a supermarket you can pay up to £5 or £6 for a half pound bag of ground coffee or beans. So can a £1.69 200g bag of Aldi Alcafé Espresso Whole Coffee Beans really be any good? I’m quite a fan of Aldi. You can genuinely find groceries in an Aldi store at surprisingly low prices compared to our conventional supermarkets. Aldi is not perfect by any means and I want to stress I have no link at all with Aldi apart from being a regular customer. I only recently became an Aldi visitor after a store opened near us last year. Aldi Alcafé Espresso Whole Coffee Beans ready for grinding. I drink black coffee. I mostly drink Americanos. I don’t mean the warm amber coloured water given away widely in US motels and hotels. I mean a double (or more) espresso shot topped up with water. I usually have to sweeten my Americanos but I also drink straight espressos and depending on the quality I can enjoy these unsweetened. Aldi Alcafé Espresso Whole Coffee Beans. The roast is medium, not dark and it’s not particularly oily. My personal preference is for a dark roast coffee with a mellow but fairly strong taste. I don’t go for flowery or delicate coffees. I can take a moderate degree of bitterness as long as it’s balanced by some mellowness and it has to be adequately smooth. As I don’t put milk in my coffee I presume that I would be more fussy about my brew – I could be wrong though! Nevertheless, I do think the quality of a coffee has to be fairly high to be acceptable to me. Aldi Alcafé Espresso Whole Coffee Beans have no problem producing a nice crema. I currently buy Sainsbury’s Continental Roast coffee beans and these are a very competitive £2.30 for half a pound (227g). I use about 14g per shot so that’s 16 cups per bag working out at roughly 15 pence per cup. I can get 14 cups out of a bag of Aldi Alcafé Espresso Whole Coffee Beans. That’s 12 pence per cup. 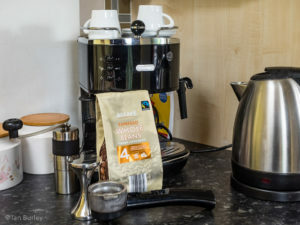 My daughter feels the Sainsbury’s Continental blend and roast is a bit too strong for her cappuccinos so for her coffees I usually use Sainsbury’s Espresso blend, which is milder but, I think, lacking in the really nice character of the Continental blend that is especially nice in my Americanos. Then I came across Aldi Alcafé Espresso Whole Coffee Beans. Originally, these were £1.99 per bag. I found that the Aldi offering was really not bad at all. 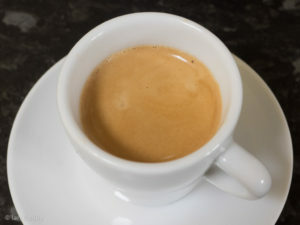 I prefer the Continental beans for Americanos but, if anything, I’d go for the Aldi Alcafé Espresso Whole Coffee Beans when pulling straight espressos. Aldi’s beans are not as dark or oily as the Continental beans. However, there is no excessive bitterness; you get an adequately smooth coffee. I can drink Aldi espressos unsweeted. There is a chocolatey hint that my daughter likes, too. The Aldi beans have good body but I know that some more up market coffees are better in this area. A quality after taste is something that a very good coffee delivers. The Aldi coffee is not offensive in this area but it’s not one of its strengths. Aldi doesn’t say much about the blend they use although it is Fairtrade-sourced, which is reassuring. I presume, as there is no claim of exclusive Arabica content, that Robusta beans are at least part of the blend. Coffee buffs often dismiss supermarket coffee as being stale before it reaches the supermarket shelves but I don’t think that’s a fair accusation here. In summary, I can thoroughly recommend Aldi Alcafé Espresso Whole Coffee Beans for general espresso coffee use. 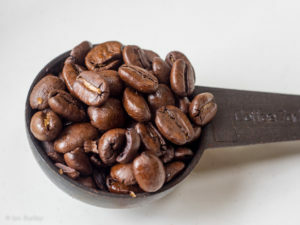 It’s fantastic value for money and while it won’t win any prizes at a gourmet coffee fest, you can use this coffee to make cuppas far better than any instant coffee and for not much more outlay. Great value for every day use as an alternative to instant coffee; well worth trying. You can get some good ones at that price point, I have just ordered another brand to try out yesterday at £9.99 per bag. Still cheaper than supermarket even if you only buy 1 bag but I usually buy 2 bags, plus coffe syrups and things at the same time, so I don;t lose my savings on postage. Plus I try and find ones on offer or with a deal. Great information. Carry on bro. 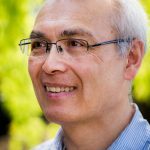 I am working as a content writter so your articles will help me to write my next project. I am regular visitor of this blog. I really enjoy a good cup of coffee, to the point that I have even taken it back to the counter if it’s not right. I keep hearing good things about Aldi, but they are a fair way away so have not been there yet.